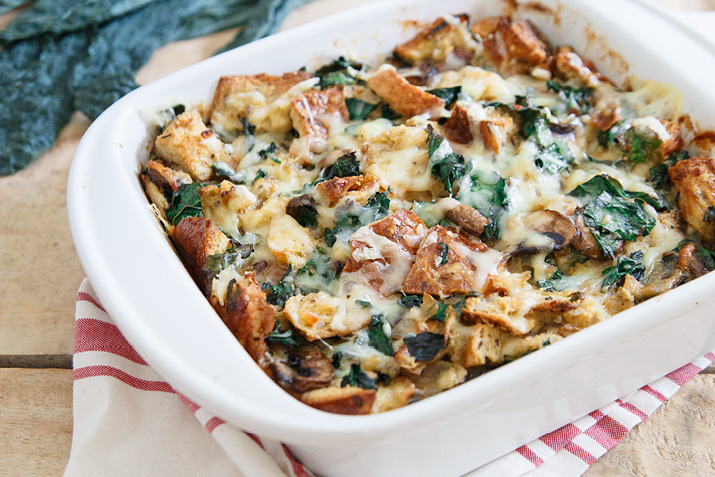 Mushrooms, Gruyere and kale add fabulous flavor and heft to this not-to-miss bread pudding. Heat the oven to 350°F. Butter or oil an 8 x 8 inch casserole dish. In a large mixing bowl, whisk together the eggs and milk. Gently fold the cubed bread into the mixture and set aside. In a large skillet, heat the olive oil over medium-high heat. Add the onion and sauté for 5 to 7 minutes until it is beginning to soften. Add the garlic, mushrooms and thyme and sauté another few minutes. Add the kale and stir until it softens. Remove from heat. Stir the cooked vegetables into the bread mixture, then add the shredded Gruyere, salt and pepper. Pour into the prepared casserole dish and bake for about 45 minutes until firm and browning on top. Remove from oven and serve warm. This is a great make-ahead dish for busy days; just assemble and refrigerate until you’re ready to bake. Accompany with spicy carrot slaw for flavor contrast and eye appeal.